California, the nation’s first state to pass a soda tax, approved of a statewide soda tax ban on June 28, 2018. 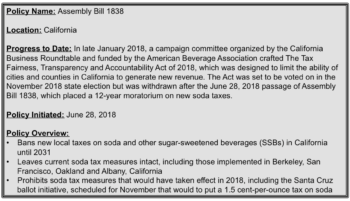 Assembly Bill 1838 was passed in response to the Tax Fairness, Transparency and Accountability Act of 2018, a ballot measure sponsored by the American Beverage Association (ABA) that, if passed, would have made it difficult for the state or local governments to raise not only taxes on soda but all taxes and fees in general. According to filings with the Secretary of State, the ABA spent $7 million to gather signatures for this ballot. The ballot would have affected new taxes and fees for libraries, public safety and other government services, generating state concern about not being able to raise needed revenue in the future. The ABA agreed to withdraw the ballot in exchange for the passage of Assembly Bill 1838 to ban soda taxes for twelve years. The Assembly passed the Bill by a vote of 70-2 and the Senate passed it 21-7. Its passage has ignited great public concern given the fact that public health professionals have been advocating soda taxes nationwide for years. According to the National Health and Nutritional Examination Survey, SSBs are the leading source of added sugar in the American diet. 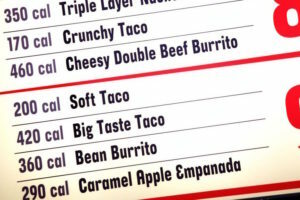 They provide calories with little or no nutritional benefit and are associated with poor health outcomes, including obesity, cardiovascular disease and type 2 diabetes. An overwhelming abundance of evidence supports soda taxes as a vital method of reducing SSB consumption with the long-term goal of improving the public’s health. In fact, an evaluation of the soda tax already implemented in Berkeley, California, demonstrates the effectiveness of soda taxes. A survey of residents in Berkeley’s low-income neighborhoods found a 21 percent drop in consumption of sugary drinks and a 63 percent increase in consumption of water in the months following implementation of the tax. In addition, another study found that just one year after the tax was introduced, SSB sales fell by 9.6 percent and water sales increased by 15.6 percent in Berkeley. In November 2014, Berkeley, California, became the first US city to pass a law (Ordinance 7388-NS) taxing sugary beverages. A 1-cent-per-ounce excise tax was placed on drinks with added caloric sweeteners, including soda, energy drinks, heavily pre-sweetened tea, as well as to the added caloric sweeteners used to produce them, including, but not limited to, sucrose, fructose, glucose, other sugars and high fructose corn syrup. Infant formula, milk products and natural fruit and vegetable juices were exempt. The ordinance was implemented in March 2015 and will be in effect for 12 years. Revenue raised from the tax is used for health programs designed to further reduce SSB consumption, particularly by children, given the fact that almost 40 percent of Berkeley’s school children are overweight or obese. Opponents of the soda tax claim that it disproportionately affects and discriminates against individuals of lower socioeconomic status (SES). The American Beverage Association in particular claims that by opposing soda and grocery taxes, they would provide protection for working families and consumers who rely on low-cost beverages and groceries. “People across the country are taxed enough, and they can’t afford new taxes on what they eat and drink,” said William Dermody, the vice president for media and public affairs at the ABA. However supporters claim that low SES individuals are disproportionately affected by chronic diseases that are highly influenced by diet, and are more likely to have limited or no access to healthcare for treatment. Therefore limiting SSB consumption is the first step to preventing poor health outcomes in this vulnerable population (Figure 1). Figure 1. Demonstrating the preventability of diet-related chronic diseases with the elimination of SSBs from the diet. Proposed mechanisms by which SSBs may promote weight gain and obesity include (1) increasing overall energy intake due to high-added sugar content, (2) incomplete compensation for energy consumed, and (3) low satiety of liquid calories. Furthermore, the high glycemic load and large fructose fraction in SSBs contribute to the development of insulin resistance, beta cell dysfunction, inflammation, hypertension, visceral adiposity and dyslipidemia, which further increase the risk of metabolic syndrome, type 2 diabetes, and cardiovascular disease. Credit: Malik VS, Popkin BM, Bray GA, Després J-P, Hu FB. Sugar Sweetened Beverages, Obesity, Type 2 Diabetes and Cardiovascular Disease risk. Circulation. 2010;121(11):1356-1364. California is not the first state to ban soda taxes; Arizona and Michigan have already done so. While many public health professionals may be disappointed in the passing of this legislation, all hope is not lost. According to Bloomberg Opinion, Assembly Bill 1838 will be short-lived if the California Medical Association and California Dental Association are able to get their measure — The California Sugar-Sweetened Beverages Tax Act of 2020 which proposes a 2-cents-per-fluid ounce state tax on sodas — onto the 2020 ballot and it is passed. In the meantime, public health advocates are advised to take action to preserve local authority and protect community health.